supported by 15,000 horses and mules, 44 artillery batteries, 1,100 wagons, and a vast array of military equipment and hardware. The plan was a brilliant one. Unfortunately, George Mc-Clellan was the one who would carry it out. By late March, McClellan's forces were in place at Fort Monroe to take up the westward march toward Richmond. His advance units reached Yorktown on April 5, the day before General Albert Sidney Johnston began his attack against Grant at Shiloh. McClellan believed he was outnumbered and slowed his forces immediately. In reality, Union forces outnumbered Confederate defenders at Yorktown four to one. McClellan's forces remained almost motionless for an entire month. Finally, in May, McClellan moved, reaching the outskirts of Richmond by the end of the month. On May 31, the Federals engaged a Confederate force under the command of General Joseph Johnston. This became a two-day battle called Fair Oaks, or Seven Pines. 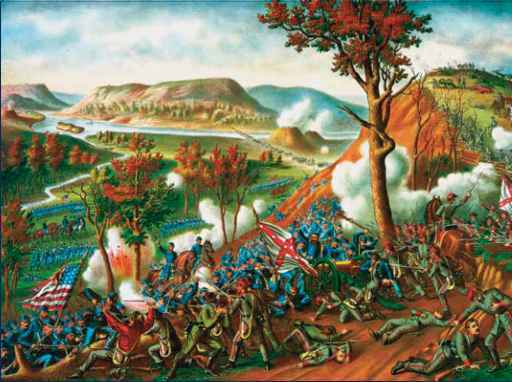 Although Rebel forces did well early on, they were finally overwhelmed by superior numbers of Union men. But the key result of the Fair Oaks battle was the severe wounding of General Johnston, who had to be replaced by a veteran of the U.S. Army, General Robert E. Lee. At that time, Lee had not led masses of men into battle during the Civil War. He would soon prove himself as the greatest general of the war. General Lee's reputation as a field commander during the Civil War began during the Seven Days fighting. He took command on June 1. Immediately, he set out to checkmate the threat McClellan's army represented to Richmond. Since Lee was significantly outnumbered by the Union forces in front of him, any offensive Confederate plan would have to be daring and bold. With his top military officer injured and unable to lead, Confederate president Jefferson Davis turned to generals Robert E. Lee (left) and Stonewall Jackson (right) to lead the rebels against Union general George McClellan and his troops. Lee, who knew the Confederate Army was outnumbered, organized an offensive strategy against McClellan that required both generals to attack with their units at two different locations. that attracted Lee's attentions. With the Chickahominy separating Porter's forces from the main body of McClellan's army, it would be difficult for McClellan to reinforce the 5th in time. McClellan had sent Porter north of the river to provide protection for the Union Army's supply line, which followed the Richmond & York River Railroad, leading to a rail depot at White House Landing, along the Pamunkey River. McClellan did not feel he had placed Porter in a difficult spot by leaving him isolated on the other side of the river: The 5th had taken up a good defensive position along a swampy creek bottom. But Lee knew better than McClellan just how vulnerable Porter's forces really were. 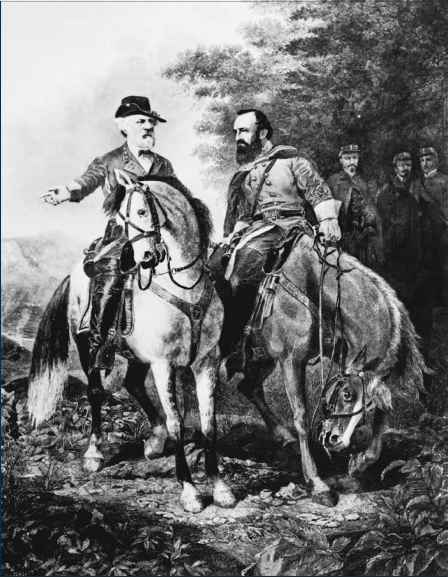 Lee's plan would involve Stonewall Jackson, who was off to the north distracting three separate Union armies so they could not turn south and reinforce McClellan. Lee secretly ordered Jackson to swing south and strike against Porter on his flank, while Lee would throw his army directly against Porter's front. It was a gamble, indeed. His plan concentrated 60,000 Confederates against Porter's 30,000. With the bulk of McClellan's army south of the Chickahominy, it would also provide an opening for the Union commander to order his remaining 75,000 men forward toward Richmond with only 27,000 Rebel troops in front of them. If McClellan took that simple step, Richmond might fall and all might be lost. But Lee knew McClellan and judged him to be a commander who would not take the risk. Lee went on the offensive on June 26, the second day of the week of fighting that would come to be called the Seven Days. The previous day, McClellan had thrown some of his men, the 3rd Corps, under the command of Major General Samuel Heintzelman, against Lee's men who held the ground directly in front of Richmond. It was McClellan's attempt at judging the strength of Lee's defensive line. The Confederate 3rd gave strong resistance, causing more than 500 casualties among the Union men while only taking about 300. McClellan judged the resistance at his front to be significant, and he wired Washington to demand more troops. He had no idea that Lee had actually concentrated his men toward the Union right.